368 classified kilometres, the works duo got an emphatic win. 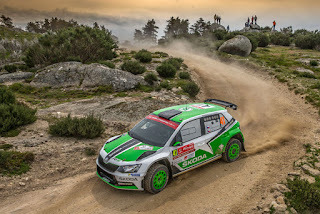 Skoda Motorsport's second start of the season in the WRC 2 was a triumph for the Skoda Fabia R5: Behind Tidemand/Andersson, the customer team Nicolás Fuchs/Fernando Mussano (PE/PE) clinched a one-two result for the Skoda brand. "This gravel rally in Portugal really took everything out of man and machine. Pontus Tidemand and Jonas Andersson weren't thrown off course by the minor setbacks and showed a very strong performance in the face of fierce rivals. My congratulations go to the entire Skoda Motorsport team, who did a fantastic job. This is a great success for the Skoda brand," said Michal Hrabánek. 1. Tidemand/Andersson (S/S) Skoda Fabia R5 4:10:46.2 hrs. 2. Fuchs/Mussano (PE/PE) Skoda Fabia R5 + 1:28.8 min. 3. Aasen/Gulbæk (N/N) Ford Fiesta R5 + 3:19.7 min. 4. Pedder/Moscatt (AUS/AUS) Skoda Fabia R5 + 3:19.9 min. 5. Campos/Magalhães (P/P) Skoda Fabia R5 + 4:06.8 min. 6. de Mevius/Jalet (B/B) Skoda Fabia R5 + 6:11.6 min. 10. Kopecký/Pavel Dresler (CZ/CZ) ŠKODA Fabia R5 + 15:36.0 min.